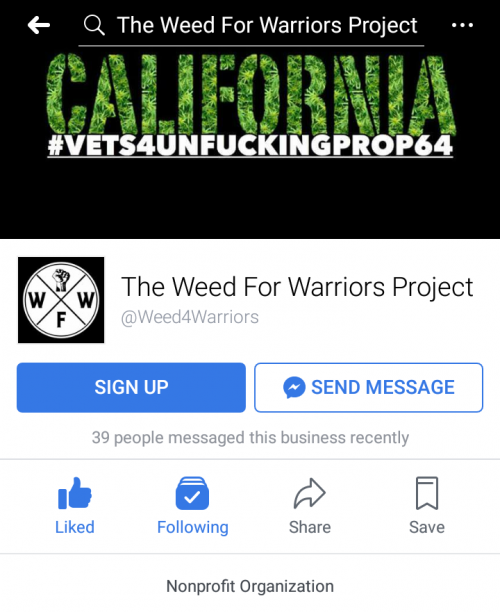 Weed For Warriors Project is a social justice lifestyle brand supporting holistic rehabilitation for veterans through community-based projects, proactive care advocacy, cannabis education and compassion WFWP urges change for the empowerment of the people. With the recent passage of Proposition 64 in our home state of California, we have been left with no choice but to institute a number of changes. In the coming months, you will notice those changes coming to fruition in many forms. Our mission, as always, is to continue helping as many veterans as we can. We get countless emails and messages about the locations of our chapters and how to get involved. We are currently on hold for any new chapters as we continue to adapt to the boundaries of the law, but our hope is for nationwide expansion soon. Our leadership is made up entirely of volunteer veterans; their safety being our number one priority, we must embrace the changes in the market while pushing forward with the mission. That being said, the following chapters are the only sanctioned chapters at this time. We have included contact information and upcoming chapter events, please contact Chapter Leadership before attending, any meeting to make sure you have everything required and we hope to see you soon! Next Chapter Meeting August 4 at 6pm. Same Place. Thank you to the 24 Veterans that came out and Special thank you to the Community without you none of this would be possible. We are extremely grateful for your generosity. See everyone on the last Tuesday of the month! Get it in the calendar and set up the carpools! 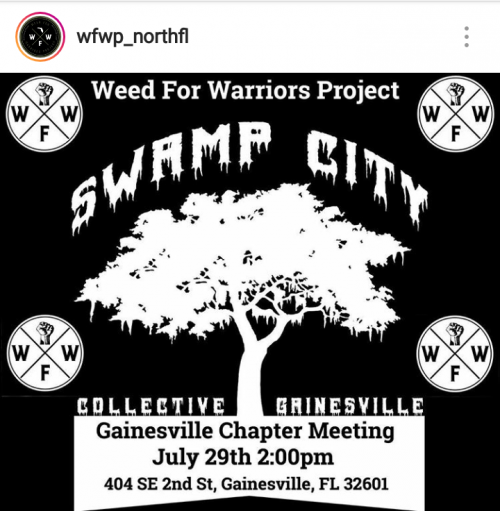 Looking for another WFWP Chapter in your area? Feel free to reach out to a Chapter Head local to you…. Veterans represent 7% of the American population, yet account for 20% of the national suicide rate. 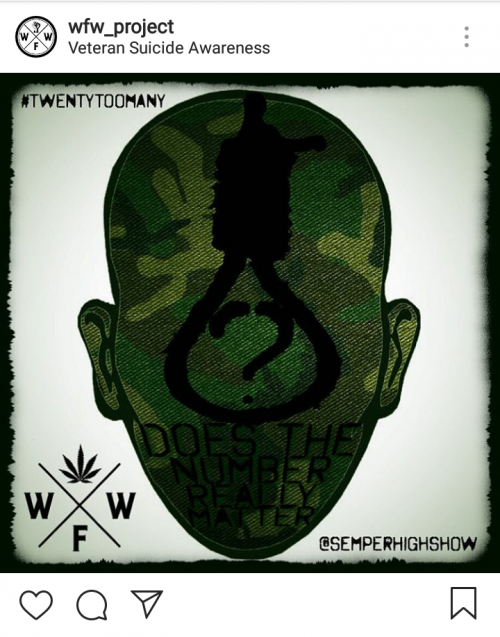 An estimated 22 veterans commit suicide per day. WFW Project finds these numbers unacceptable. The assistance and prescription programs our veterans are provided with are not working. We believe cannabis is the answer. Watch, read and learn about our goal to use this life-saving plant to restore our veterans’ confidence, mental well being, and the ability to lead normal healthy lives. 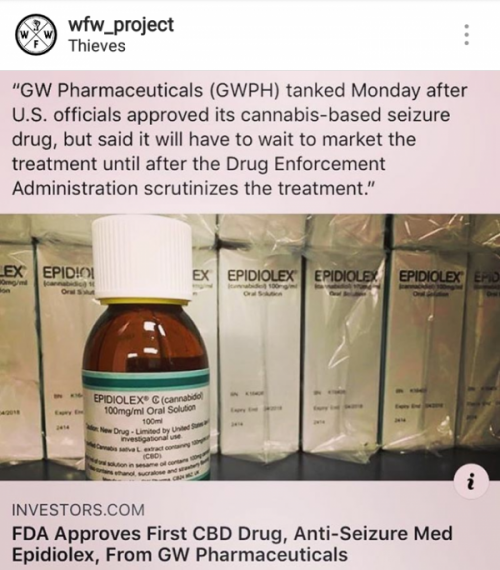 Big Pharma has landed! Watch how quickly the feds change their tune and attempt to hand control of our medicine to Big Pharma! 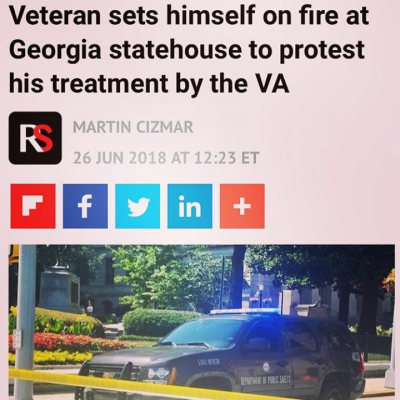 A disgruntled veteran set himself on fire outside of the Georgia Capitol in a personal demonstration Tuesday morning. The 58-year-old veteran was protesting how he had been treated by the Department of Veterans Affairs, authorities said, Fox 5 Atlanta reported. He reportedly used fireworks and gasoline to set himself on fire. The Georgia State Patrol responded to the incident, which occurred during a news conference it was holding nearby. 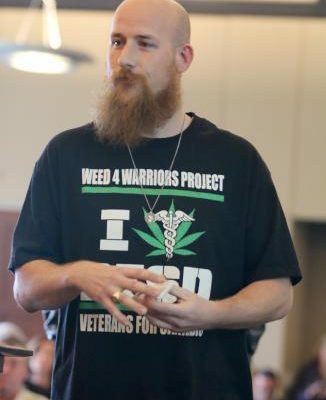 Kevin founded Weed For Warriors Project (WFWP) in 2014 after his own suicide attempt, when a comrade offered him a couple edibles as a way to help lift the weight off his shoulders. Within 30 days Kevin was off opioids and alcohol. He was motivated to share the plant with all of his service brothers and sisters. 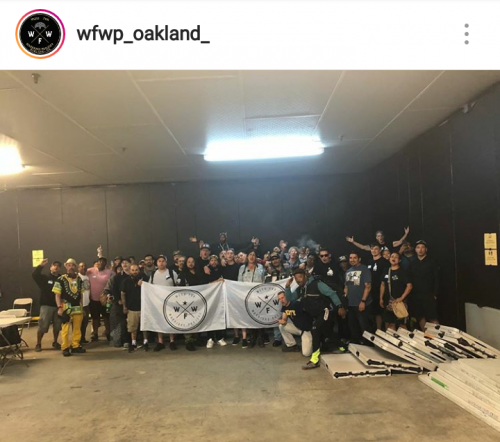 Starting the first chapter in San Jose, California the WFWP now has chapters across California and in states such as Florida, Wisconsin and Nevada. 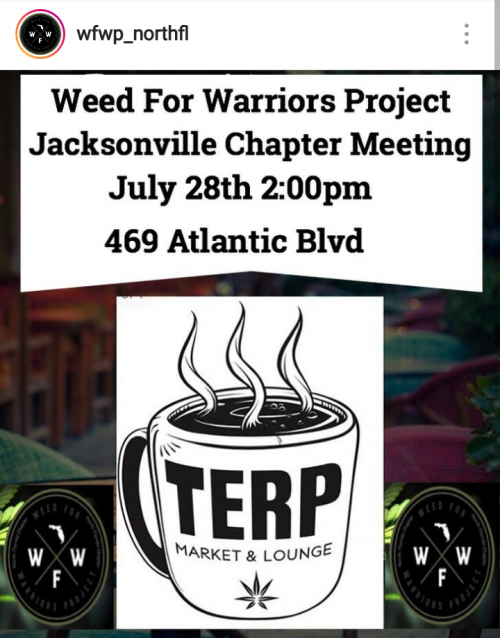 As the cause grew, Kevin recognized cannabis was not the only contributor to healing at the meetings; fellowship was just as essential to the veterans’ recoveries from their many service-related injuries and ailments. Fellowship was easily found through the common thread of cannabis as medicine and thus WFWP was formed. Kevin’s motivation to serve in the United States Marine Corps and ultimate ranking of E-5 Sergeant perfectly place him into the role of Founder & Creative Director in WFWP as they transition the organization from volunteers and donations into the up and coming for-profit cannabis industry, as well as other markets. If Kevin could choose three words to describe the organization that he created, they would be Community, Compassion & Cannabis. 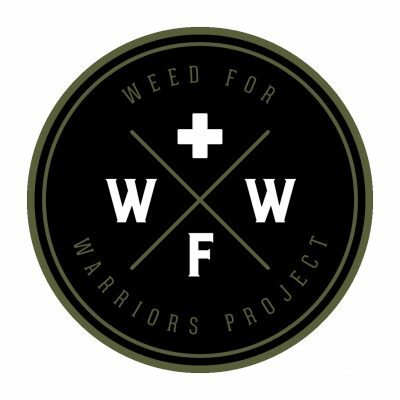 Sean Kiernan is CEO of the Weed for Warriors Project. An honorably discharged Veteran, Sean served his country in Central America as an airborne infantry soldier on the front lines of our failed drug policy from 1989 to 1993. After his service, Sean used the GI Bill to attend and graduate from UC Berkeley where he then went onto a career in finance. For nearly two decades, Sean’s career spanned being an auditor at Ernst & Young in San Francisco, an analyst in JP Morgan’s Financial Sponsors Group in New York City, to his eight-year tenure at Caxton Associates where Sean helped run an activist hedge-fund focusing on neglected and underfollowed companies across multiple industries to include the biotech, pharmaceutical, private prison and rehab industries. 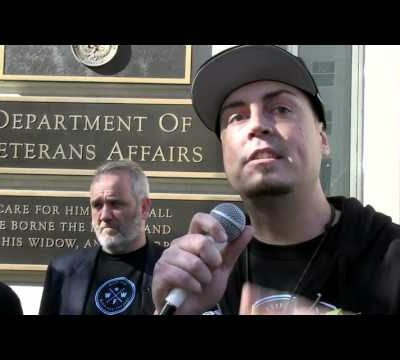 Sean has dealt with the suicide and overdose epidemic first hand, as a suicide survivor, a disabled veteran and through his advocacy, Sean is raising awareness and helping provide access to medicine for those in need. 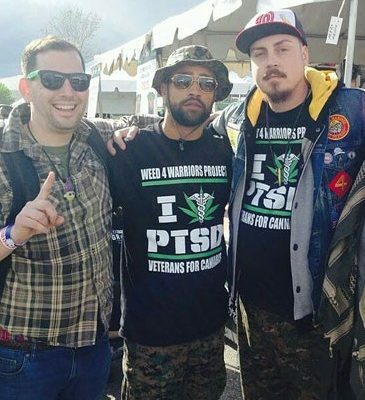 Having worked tirelessly with Dr. Sue Sisley since 2013 to advance MAPS research on Cannabis in veterans suffering from PTSD, Sean joined the Weed for Warriors in 2015 after meeting Founder Kevin Richardson at the High Times Cup in Denver. 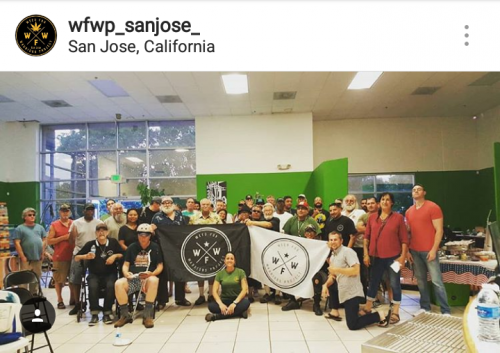 Sean’s personal and professional experiences provide invaluable insight to WFWP as the organization prepares to transition from its grassroots beginnings to licensed operator in California’s legal cannabis market. As one of the most vocal critics of our unfolding cannabis policy framework, Sean’s views have been covered extensively in the print media. Sean has appeared on CNN Weeds 3, VICE, and most major networks advocating for the very change WFWP is implementing. Sean’s broad set of experiences offers him a fresh perspective into the pragmatic realities facing the veteran community. Mark began giving away cannabis from his own garden in January 2015 under the name Meds4Vets. After joining the United States Marine Corps at age 17, Mark completed his enlistment in 2007 and found cannabis again after experiencing serious side-effects from alcoholism. When he realized how expensive and often unreliable the availability of medicine was, he eventually began to grow his own in order to ensure he was never without it. 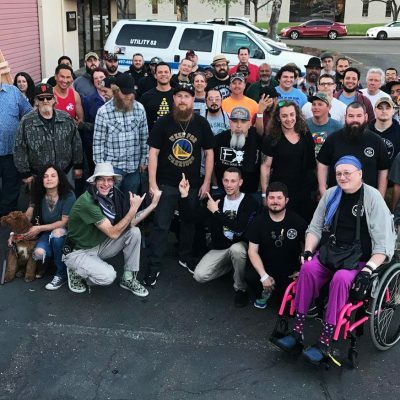 Within 90 days of having meetings in Sacramento, CA, the group had outgrown the location; and like Kevin had seen, he realized the camaraderie was what brought veterans back over and over. 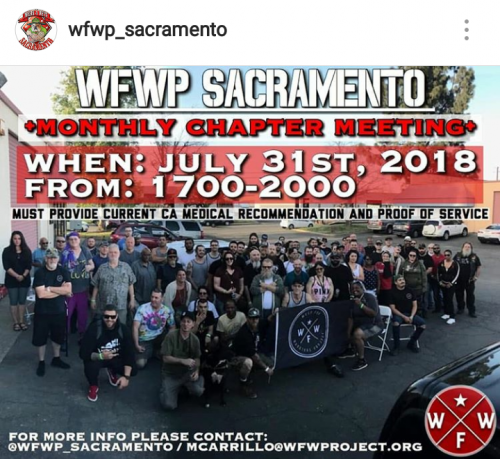 After meeting Founder Kevin Richardson in 2015, the two began working together and Mark officially changed his Meds4Vets group to WFWProject Sacramento. Together, Kevin and Mark organized other veterans to develop all of the California chapters and then the additional Florida, Wisconsin and Nevada chapters. 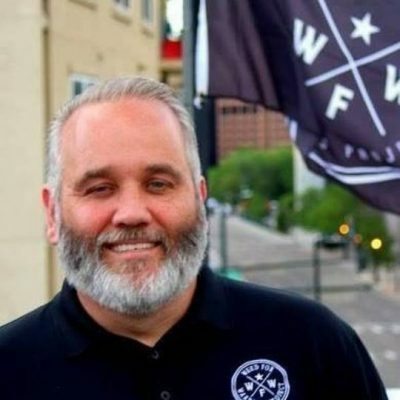 As WFWP transitions into a for-profit model Mark’s service in the United States Marine Corp and his impeccable organizational skills leave him well placed for the role of Chief Operations Officer and Director of Chapters. 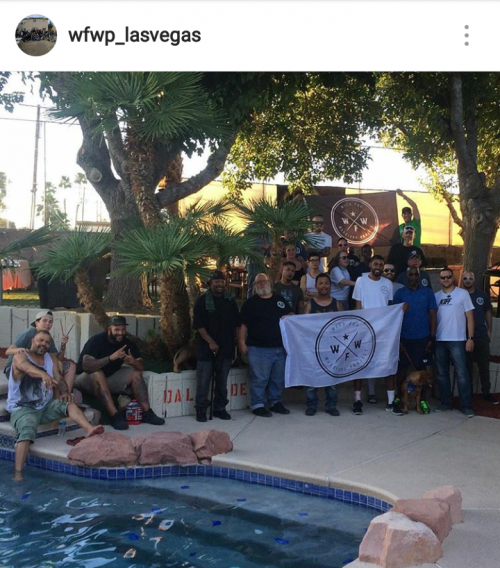 His goals, in working with WFWP, are to help give vets something to look forward to, through the chapter meetings, once a month as well as to help end veteran suicide and assist in giving other natural options than the ones offered by the VA doctors. 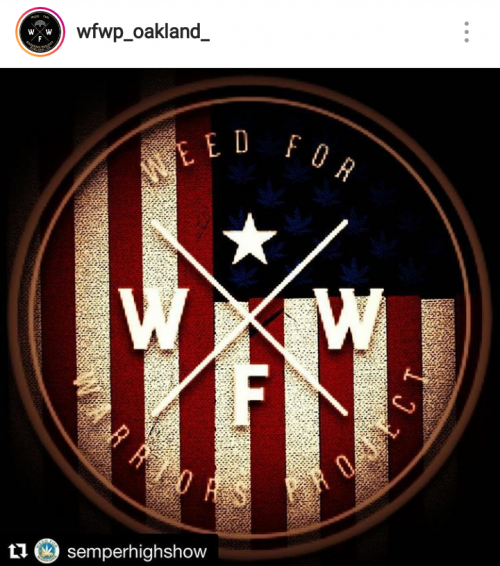 Dale joined the Weed For Warriors Project (WFWP) team in 2017 to help with the transition into the for-profit California cannabis industry. 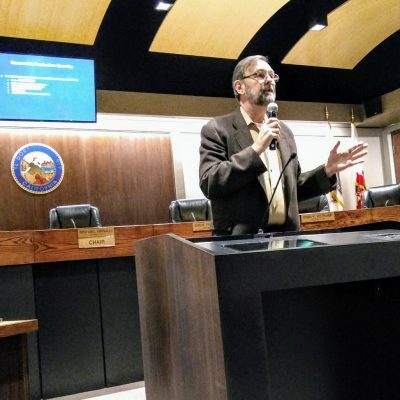 His time in the United States Navy, as an E-4 Corpsman, almost 32 years as a California attorney and nearly 21 years in the evolving California cannabis community, turned industry, have him well placed as Lead Counsel with WFWP. Dale was drawn to WFWP after a Proposition 64 debate pitted he and Sean Kiernan on either side of the ballot issue. 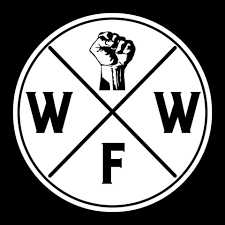 Although he an Sean debated each other Dale found himself understanding and passionate about many of the compassion topics that came from that discussion and he jumped at the opportunity to be a part of and work with WFWP. 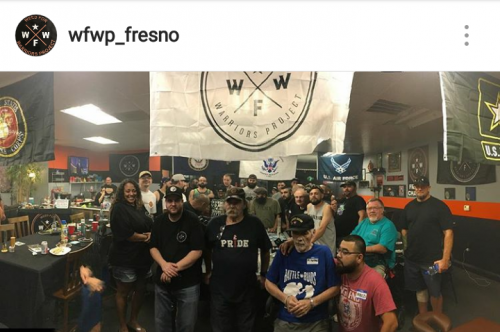 WFWP is passionate about compassion and here you will find examples of how our chapters are giving back to veterans and the community around us…. 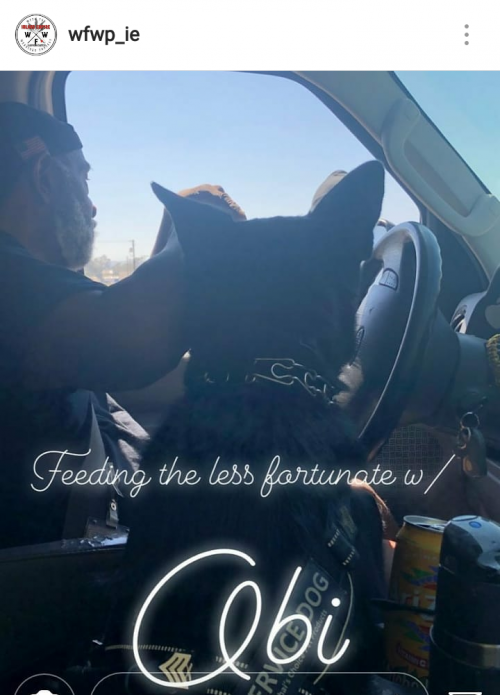 OBI, llsa and I fed approximately 90 homeless men and women at the Riverside Outreach Center, we left feeling really GOOD. Hot dogs, soda and chips. 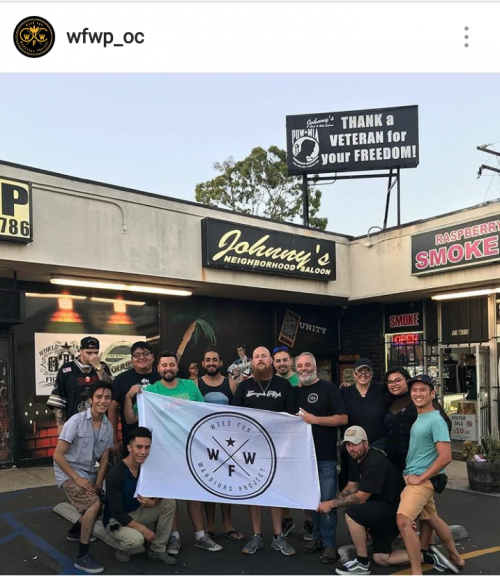 Our mission, at WFWP, is to urge/encourage change for the empowerment of people; not just the veterans we currently serve but the citizens we signed up to protect. Some of the improvements we have been working on, in the area of change, is California Senate Bills 829 and 1302. 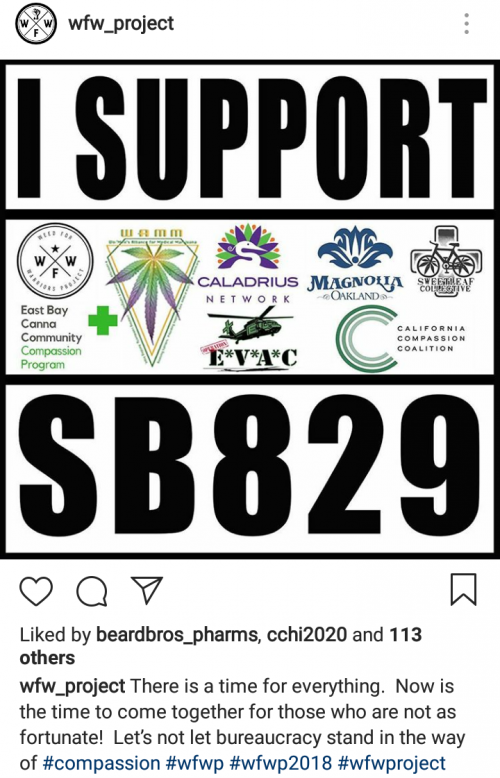 You might remember that we included this California Bill in our last Newsletter. 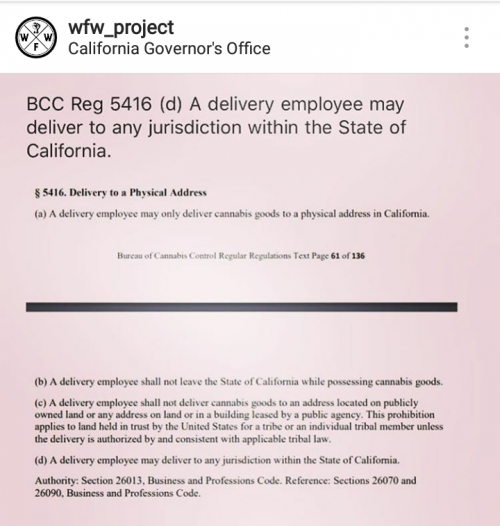 Although the Senate Bill, addressing access to medicine via delivery, has been officially “shelved” we had the surprise of waking up, this morning (July 13, 2018), to find that the basic language was included in the first draft of the California Bureau of Cannabis Control’s permanent regulations…. Sometimes the surprises in life are the most rewarding – @caitymaple, Max (Mikalonis) and @wedrop – amazing job @canorml and all those who helped. 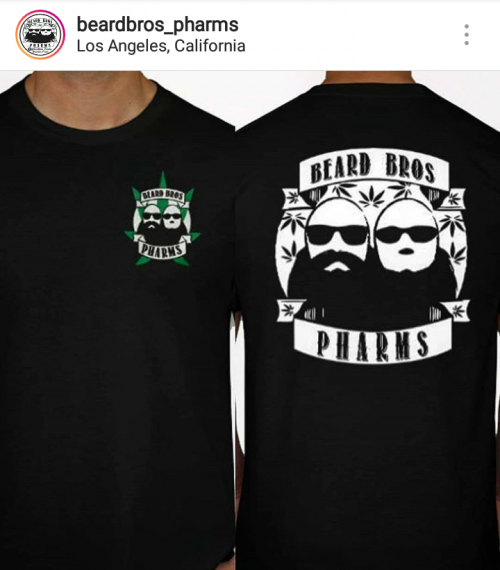 Delivery is open in the entire state new BCC regs just released. Thank you to the Governor’s office….